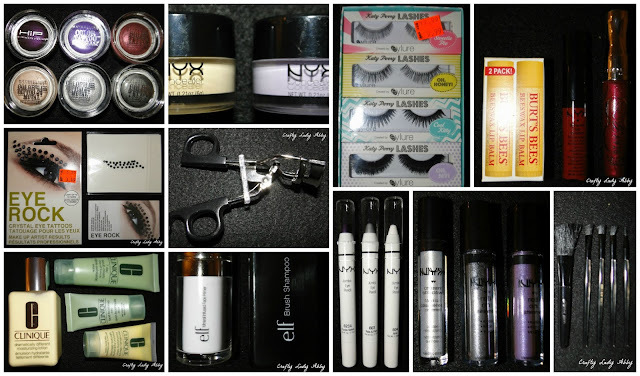 Recently, I went a little crazy stocking up on more beauty supplies for dramatic and camera ready makeup. This is mostly for League of Space Pirates things, but also, it's a great for any time when I feel like wearing very dramatic and flawless makeup. If you know me well, or have been following me on here or on Facebook, you know I don't wear any makeup on a regular day. I normally only wear it for special things. I used to wear makeup every day from about age 12 till I got married at 22. After that, my husband said I looked beautiful without it, and I stopped wearing it daily. I only wore it to work, until I had our daughter, and then it was reserved for very special occasions. Since doing band events is full costume, I need dramatic makeup to go with the dramatic costume. My regular makeup just doesn't work well. It's too simple to photograph well on stage, and barely registers close up. I think my eyelids are a bit hooded, so if the color is just on the lids, it doesn't show much if at all in photos. In person, you can see it, because my eyes move and my eyelids shift. To make dramatic makeup looks work, I need the proper gear. I've been playing with red eyeshadow looks, which I will still continue to do, but I wanted to go back and redo some old favorites...a silver to black smokey look and blended purples. I bought some colored and neutral bases, glitters, and eye crystals play with. I also needed some basic stuff like color correcting concealers, brush cleaner, face primer, lip balm, moisturizing lotion...etc. I also bought a few things that were random finds and got a few things free. We'll get to all that below, where I break down what the products are and what my intended uses are for them. Here is everything that I bought at various places. The prices don't matter, as pricing is different regionally and at different stores...even ones in the same area...yeah. I bought the most eye products this round of shopping. 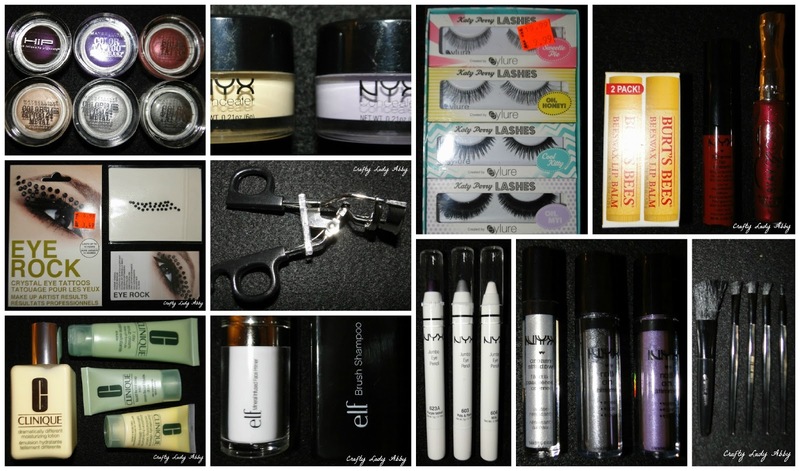 Like I mentioned above, I mostly needed supplies to do dramatic eye makeup. These are great products to use as a base for powder eyeshadows. They are all creamy, so they make a sticky layer on your eyelids, so the powdered eyeshadow has something great to stick to. They help make the eyeshadow pigments stronger, and increase the staying power of them, which is fantastic when I need to wear makeup for HOURS and need to look consistent the whole time. I bought 2 different kinds at various places. The top left is L'Oreal Paris' HiP (high intensity pigments) Color Truth Cream Eyeliner in Eggplant, from Five Below. Five Below carries a lot of discontinued products from regular brands. This one is no longer being made, but can be found on Amazon and various other places until the stock runs out. 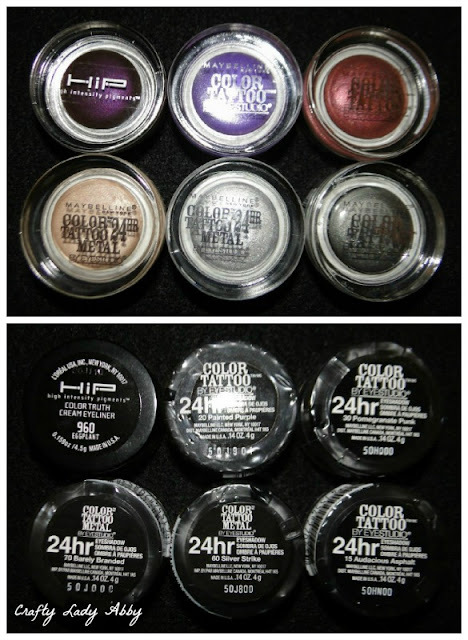 The others are all Maybelline Eye Studio's Color Tattoo 24 hr Eyeshadow from Rite-Aid, Target, and CVS. The colors are Painted Purple, Pomegranate Punk, Barely Branded, Silver Streak, and Audacious Asphalt. The Barely Branded and Silver Streak are from their new Metal collection. The others are in the permanent collection, but I'm hoping the Metals stay too, as they are great colors. 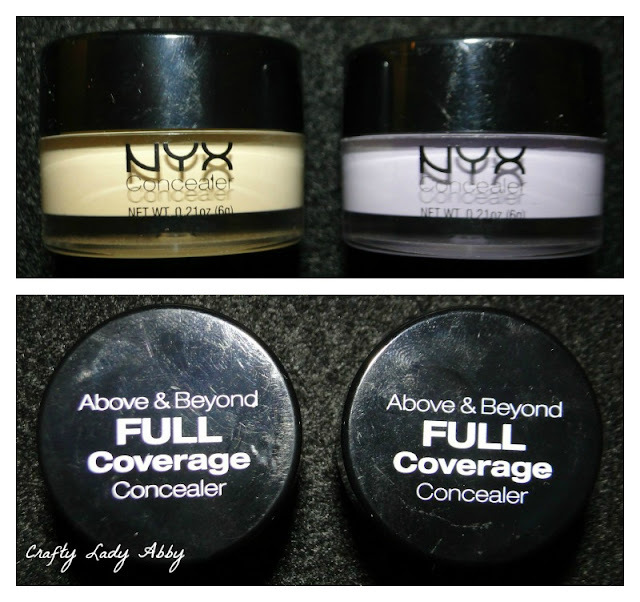 I have dark under eye circles and occasional redness, so I bought these special concealers to help battle those issues. These are cream concealers in little pots by NYX. I purchased them at Ulta, as well as the next few things. I'll let you know when I switched to another shop in a little bit. I wanted some shimmery products to make my eye makeup more fabulous. I don't really need an excuse for buying glittery things...this is me I'm talking about. 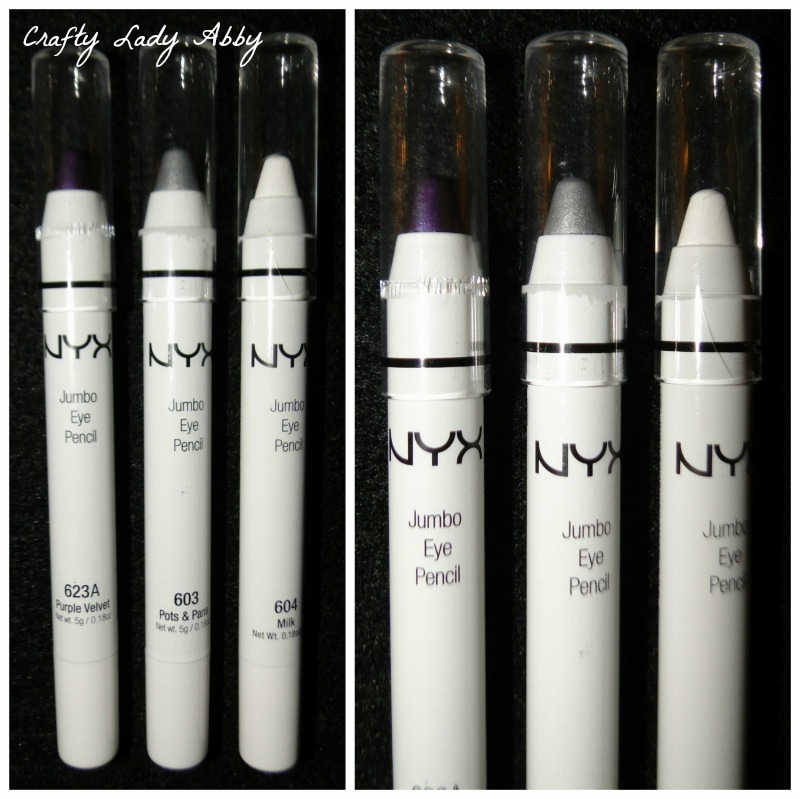 These three are by NYX. The 1st product is a cream shadow in Silver Argent, which will work great as a base. 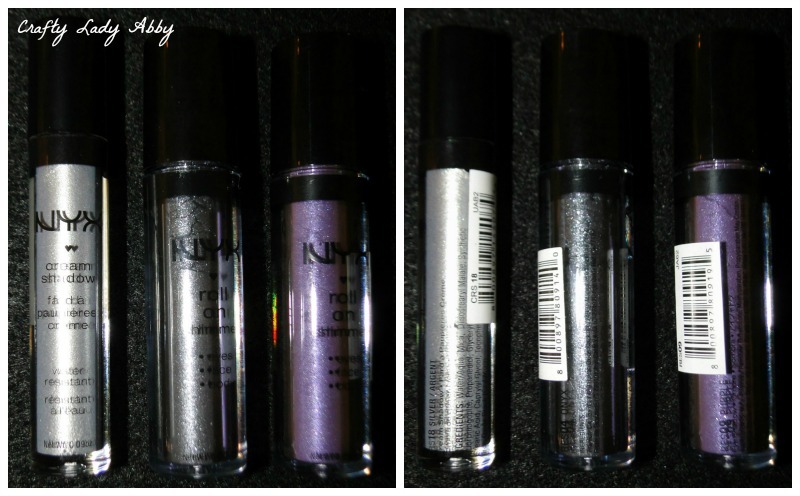 I love using silver when I wear makeup, because it brightens my eyes and blends well with other colors and neutrals. The other two are roll on shimmers, in onyx and purple. Since I wanted to do more purple and smokey looks in a dramatic way, I wanted glitters to go with it. I'll probably buy Bye Nye glitters eventually, but I want to test these out. These NYX Jumbo Eye Pencils work great as bases for eyeshadows. I bought the Purple Velvet one to play with purple eye looks. I already have a Pots and Pans one that I use a lot, but a 2nd will always been handy. The last few times I've gone to Ulta, they've been out of Milk, but they had it this time. While at Ulta, I looked through the clearance section and found these Eye Rock Crystal Eye Tattoos in Jet Black. I bought 4 packs of them since they were so inexpensive. I pulled the out of the package, so you could see what they actually look like. They aren't exactly what I expected. I'm going to try them out soon, and see if I like. If I don't, I'll return them all. 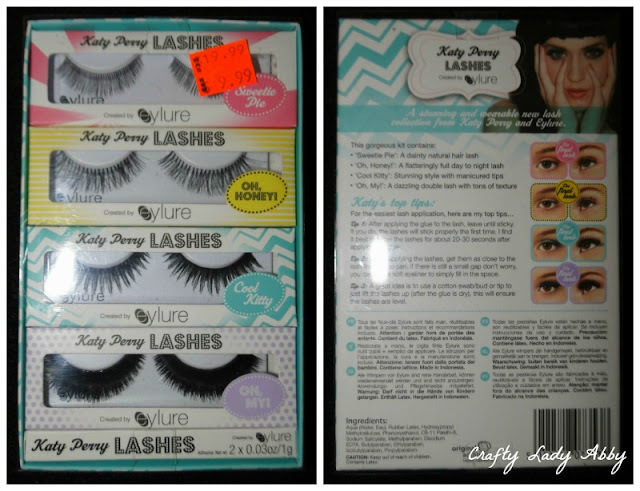 Also in the clearance section at Ulta was this multi-pack of Katy Perry false eyelashes. These are a bit of a starter set, from basic to dramatic. As someone who doesn't have any experience with wearing false eyelashes, they are a good place to start. I bought some super dramatic ones back in November, but I've hesitated with using them, since I really need to start with something basic. From basic to dramatic I have Sweetie Pie, Oh Honey, Cool Kitty, and Oh My. The Oh My lashes are actually double lashes...two sets made into one, so they are very thick. I'm interested to see how something so dramatic looks on my eyes...but that will be some time before I get to those. I went to Target to get some ELF products and found these fancy eyelash curlers by them for $1. They are fancier than my normal ones. They also come with this little guard that keeps them together when not in use. They are very springy. When I travel, I like to leave my regular brushes at home and take small ones. I went to Five Below to see what goodies I could find. I found these sets of 5 small brushes for $1.99 each by Wet N Wild. I bought two sets. Since the brushes are compacted into the packaging, I opened one package up so you all could see them...and me too. I also bought two duplicate full brushes at Target from ELF. I forgot to photograph them, as they are duplicates of some of my favorite brushes that I use often. I had misplaced by beloved Burt's Bees Lip Balm, so I bought this 2 pack at Target. While at Ulta, I bought this NYX Xtreme Lip Cream in red. While at Five Below, I found this Rimmel London Stay Glossy. I have the black one and hadn't seen a red that I loved, so this was a pleasant surprise. While I was at Ulta, I decided to go next door to Macy's and buy more Clinique Dramatically Different Moisturizing Lotion. Mine is running low and needs to be replaced. There were a few other ladies around the counter before me, so I was patiently waiting for one of the 2 employees to handle my request. I didn't need anything complicated. They were confused as to if I was helped or not, which they all apologized about, but wasn't a problem exactly. When the 3rd one got back from lunch, she found me the lotion I wanted. I asked her if she had any samples of eye creams. She didn't, but she did have a travel size of the same lotion I use, a 7 day scrub cream, and a liquid facial soap, left over from a gift with purchase event they just had. As you can see in the photo, the samples are very large, which is awesome.These will be very handy for traveling, and they are already tucked into my travel case. While at Target, poking through the ELF section, I found this face primer (to use before any other makeup...layers people layers! ), and a brush shampoo (all my brushes need a good cleaning). I'm hoping both of these work like they are supposed to, but they aren't a big expense loss if they don't work. That is it for now. I will have a couple makeup looks up soon from this week's League of Space Pirates events. I'm definitely going to be playing with some of these new products combined with some other semi-new products.